Myers-Briggs is nothing new. I think I first took it when I was in my mid-20s. While I don't think I've changed that much over the last 30 years, M-B might think otherwise. Back in 1990 (or so), I first came up as an ESTJ. I questioned it then, but realized there was a 'short' version of Myers-Briggs and much longer one. I also felt, at the time, the questions were more open to interpretation and probably second guessed myself on them. The questions - then and now - make me flash on (a) certain event(s) and that is how I probably answer the questions. This would seem unwise. 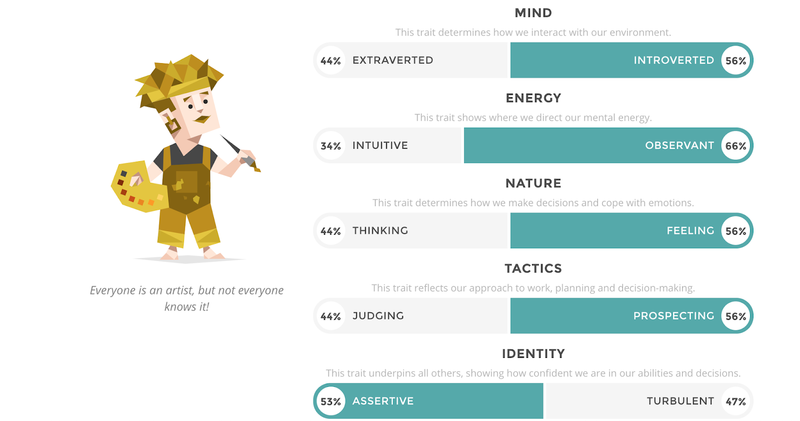 I am assuming you'd want a broader perspective, but perhaps the questions asked take that into consideration and adapt your personality type as such. An NYT Modern Love article had a person basing her new relationship on the 16 Personalities "quiz". I mean, 16. That's like TWO Syblis. First off, the article was crappy in the first place. The second, it truly buried the lead. She had left her husband of 19 years and the new person she was quizzing was a woman. She kind of left out the scrod-chomping aspect of this. Later in the article was more about the potential new partners info of full tatt'd sleeves, piercings and her younger age. I'll go with probably much younger. Yes, I'm making assumptions, but let's just say lady A got married at 20, she's 40 now. It's doubtful this relationship was going to stand the test of time due to a 100 questions survey. These tests are guesses at best. I've taken Myers-Briggs four times during the length of my career(s) and gotten four different answers. I'm not sure if that says more about me or the test. I think it's perfectly normal to be fluid. Things change. People change. Seasons change. Exposé said so in their 1988 hit. It was a 15 minute experiment. Do you think yours is accurate?? Heh. I'm apparently The Commander. Who knew? 'Mediator' here. Not such a surprise, recognising self as a conflict-phobe. How is judging not 100%? I was ESTJ last I took it 10 years or so ago. I didn't know they have names now. This is bonkers! I'm a mediator? Well, yeah but it is hard to figure out which degree of circle to choose. I think someone close to you should do the test for you. Balder Half would chose different answers for me (or degree) than I would. Deedles - a decade plus ago I was a Mediator. And Morty, I know, right??? I'm a Defender. I can live with that.